Terri Bibby started weaving over 30 years ago in Edmonton when the quilting class that she wanted to take was full – but there was a spot in a weaving class. She jumped in and joined the Edmonton Weavers Guild and took the Master Weavers classes at Olds College. 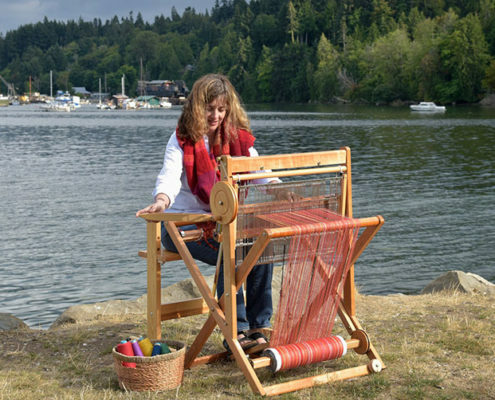 She moved to Salt Spring Island in 2004, hoping to do more weaving. Since first seeing SAORI weaving in 2005, Terri has immersed herself in the philosophy and practice of SAORI weaving. There was no turning back. The freedom, the colour, the textures and the beautiful philosophy of SAORI was life-changing. Terri went on a trip to Japan in 2007 and met Misao Jo and the Jo family that carries on the philosophy of SAORI weaving and has now been back 6 times to continue to learn and be inspired. 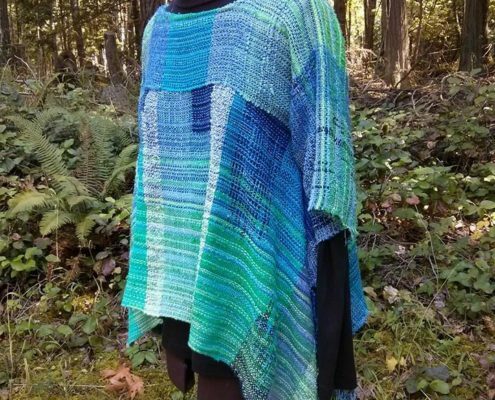 In her studio in the woods on Salt Spring Island, Terri has been offering classes, workshops and retreats on SAORI weaving, warping and clothing design for all ages since 2007. Her own weaving is inspired by the ever changing colours and textures of nature that surround her. 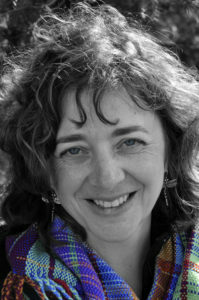 Terri has had over 1,800 people “Weave for Peace” on beautiful peace banners that have been displayed around the world. She is a member of the SAORI Leader’s Committee based in Japan and her studio, SAORI Salt Spring, is part of the SAORI Global Network. Starting as a teenager and learning from my Grandmother, I have always had a passionate interest in the fibrearts…from knitting to crochet, beadwork, cross-stitch, etc. When I first took a weaving class in 1984, I knew that this was the thread that tied things together. I jumped right in and joined the Edmonton Weavers’ Guild and got involved. After taking courses, workshops and Master Weaver classes at Olds College, I completed many types of weaving for guild sales and by commission. I went on to study Fibre Arts at Grant McEwan Community College until the program was cut back and then cancelled, so unfortunately didn’t start soon enough to complete the whole program. In the fall of 2005, after moving to Salt Spring Island, BC, I met a SAORI weaver and rediscovered weaving in a new way. SAORI weaving encourages expression of self, a freedom of weaving, of colour, texture and fibre that felt like a homecoming. 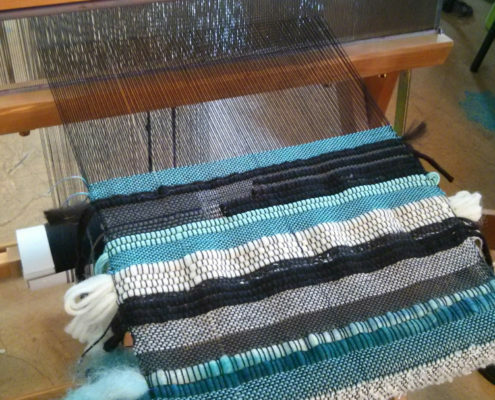 I started weaving SAORI style as soon as I got home and never looked back. In June of 2007, I went on a “once in a lifetime” trip to Japan with Mihoko from SAORI Worcester to take a SAORI Peace Banner to Hiroshima. I also wanted to explore the roots of SAORI weaving where it started – in Japan. We met Eiji Jo, Kenzo Jo and other family members as well as many other people involved in teaching SAORI weaving. We had a workshop with Kenzo Jo in which he shared many wonderful ideas. It was an amazing trip! In the spring of 2010 I was able to spend time in Osaka studying with both Eiji Jo and Kenzo Jo and meeting more fabulous SAORI people. We also were there to celebrate Misao Jo’s 97th birthday! I visited Japan again in 2014, 2015, 2016 and 2017 and hope to go as often as possible to continue the connection to Japan, to SAORI and to the Jo family. In early 2018, Misao Jo, the founder of SAORI weaving, passed away at 104 years of age. I feel so blessed to have met her and celebrated a few of her birthdays with her. I last saw her in the fall of 2017 when I was at SAORI no Mori. Thank you Misao-sensei for all that you have brought to the world through the wonderful philosophy of SAORI weaving! SAORI weaving is a way to self, to heart and to healing. There are no mistakes, only the joy of creation. Workshops, classes & retreats are offered in my quiet studio in the woods on Salt Spring Island, BC Canada. I also distribute SAORI Looms, books, equipment and yarn in Canada. Please contact me for more information. 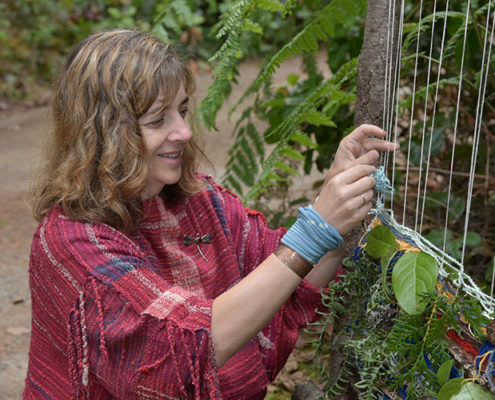 Saori weaving is a way to self, to heart and to healing. The SAORI Studio on Salt Spring.